Trump’s Fed Feud; Indexing Capital Gains Taxes to Inflation? Coming up we’ll hear a wonderfully fascinating interview with first time guest Samuel Pelaez of Galileo Global Equity Advisors. Sam highlights what he views as a tremendous investment opportunity in commodities right now, and also talks about how the markets may be getting it wrong when it comes to the trade wars and the likely impact it will have on the U.S. economy, inflation and the dollar. 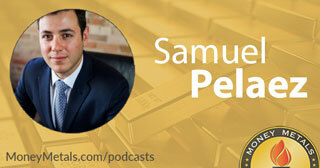 Don’t miss a tremendous interview with Samuel Pelaezel, coming up after this week’s market update. Precious metals markets faced additional modest selling pressure this week as the Federal Reserve telegraphed two more rate hikes to come before year end. As of this Friday recording, the gold market shows a 0.4% weekly decline to trade at $1,219 an ounce. Silver is currently valued at $15.55 and is now flat for the week. Platinum is up 1.1% at $844. And finally, palladium is down 1.1% with prices now trading at $922 per ounce as of this Friday morning recording. Well, at Wednesday’s policy meeting, the Fed held its benchmark funds rate steady at 2%. However, policymakers reiterated previous indications that they intend to continue hiking rates, with the next one likely coming in September. Additional tightening would put the central bank at cross purposes with the goals and priorities of the Trump administration. President Donald Trump recently called for the Fed to keep interest rates low. Fed officials may now feel that their jealously guarded independence is being threatened and that they must reassert it by raising rates in defiance of the White House. The Trump versus Fed feud will likely heat up again next month, assuming we get another rate hike. The potential upshot is that an agitated Trump may reintroduce calls to audit the Federal Reserve. Trump had made Audit the Fed a part of his campaign platform, but since being sworn into office he has neglected to push it. Fed chair Jay Powell opposes greater transparency to the public in in the name of… you guessed it – independence. That’s really just a code word for secrecy. In reality, the Fed has never operated independent of political and banking interests. It has just kept it secret from the public. The way much of the news media portray it, Donald Trump is breaking with longstanding tradition by trying to influence monetary policy decisions. The reality is, most presidents have exerted pressure on the Fed privately through various means. Lyndon Johnson reportedly went so far as to physically push Federal Reserve Chairman William McChesney Martin against a wall to try to intimidate him into backing off on interest rate increases. And Alan Greenspan notoriously entered into a gentleman’s agreement on policy objectives with the Clinton administration to ensure he would get reappointed as Fed chairman. For now, though, the Fed remains under pressure from the White House to stop hiking. The Trump administration believes it can counter the negative effects of tightening to some extent with more stimulus from tax cuts. This week the Treasury Department announced it would look into making an administrative change that would index capital gains taxes to inflation. Under the current system, investors are taxed on the full amount of their nominal gains on assets. For example, if you bought $10,000 worth of stock shares or gold coins in 1988 and sold them all today, you would owe taxes on gains that include 30 years’ worth of inflation. Gold prices are about three times higher today than in 1988. But that’s mostly because of inflation – the loss of purchasing power of the dollar over that period. If your gains were adjusted for inflation, then your tax bill would be much lower – or perhaps even nil. And the government would no longer profit from pumping up the inflation rate. That’s the idea behind the Trump administration’s push to index capital gains taxes to inflation. It would certainly be a big step toward bettering some of the unfair distortions caused by inflation. But it wouldn’t stop the inflation problem at its source – that being the relentless expansion of the currency supply by the Federal Reserve. Samuel Pelaez: Yeah, absolutely. That's my favorite all-time chart I think. I'm a big proponent of commodities and natural resource investing. Keep in mind, that chart goes over 60 years or so of markets. We've had cycles like this three times or this will be the third time. Twice in the past we’ve seen that sort of extreme rating where commodities are so undervalued relative to the broader market as measured by the S&P 500. Now, I'd like to switch gears a little bit and get your take on the overall health of the markets in general. Around here we wonder how “real” markets are these days. For starters, we have central banks here and around the world heavily involved in markets. Interest rates are centrally planned. And these days it is commonplace for central bankers to be buying corporate stocks and even bonds for that matter. Then there's the mounting evidence of more underhanded activity. Bank traders colluding to rig prices in everything from metals to LIBOR and to cheat their clients. In recent years the advent of high-frequency trading has raised concerns that retail traders may not get a fair shake. But then lastly, and you did mention COMEX and I'm glad you did, because I don't know if people are aware and I don't think they are, when you buy a gold futures contract on the COMEX, it specifically states that you can redeem in kind. Meaning you can actually show up to COMEX and demand to be paid in physical gold. The problem is… and this number fluctuates… but there's about 400 contracts for every ounce of gold. Meaning if just one out of 400 people show up to reclaim their gold in physical form, the COMEX vaults would be completely empty. You cannot say that about Bitcoin or a paper wallet of Bitcoin or a physical wallet of Bitcoin. So, I'm not subscribing to that thesis that cryptocurrencies are a store of a value akin to what gold is. I do subscribe to the thesis that blockchain technology… and I think tokens are just one representation of blockchain technology… blockchain technology is transformational for multiple industries. The payment processing industry or the barter industry let's call it, is obviously the most ripe industry for disruption from this kind of technology and that's what Bitcoin has done and Ethereum in the field of crypto have done, is create a secondary market for transactions outside of the fiat world. We believe that's part of the magic sauce. There's a few other factors that they're clearly listed on the marketing materials, you could get those at the U.S. Global website or at the Galileo Funds website. And what we've been able to achieve and I want to make sure that this doesn’t sound promissory, it’s actually based on the one year of performance, is the data of the ETF to the upside as in how it moves to the upside relative to the gold sector is about one for one. So when gold starts to go up, owning our product or owning any other product is about the same. It's when the markets go down that our ETF goes down by a lesser amount than the competing products. And then when you bootstrap that difference over a long time, it creates a very big spread above performance. So far for the one year, our product beat the GDX by about 8%. That’s a pretty… I call it… a pretty impressive alpha generation. The fund also has a lower management fee and it has a lower standard deviation or pretty much every other risk metric is inferior. Samuel Pelaez: I'll give you anecdotal piece of evidence. I had some friends visit from Colombia, where I'm from originally. And the first thing they mentioned was, and they looked at all the cranes and they said, "Wow, there's so much construction going on." And I guess because we live in North America and we see it all the time, we don't really recognize it every day. But, just think about all the wonderful things taking place in terms of… if you travel to New York often you've seen the big transformation that's taking place at the airport at LaGuardia. I'm sure in all your communities and your cities you're going to see major projects being built. President Donald Trump has made a big focus of his presidency to roll out a major infrastructure plan. So, we're going to need these commodities. It's not like we achieved that peak moment of commodity demand. Commodity demand continues to go up every year. It's almost like GDP growth. So we will need these commodities. And right now you have the opportunity to buy them at one of the cheapest relative valuations that you've had in the last 20 years. And if you're like me, I wasn't investing – I wasn't old enough to be investing in the '90s – this is the best entry into the resource market that's ever been presented to me.